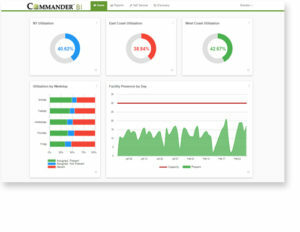 Commander BI is office space utilization software to inform CRE and facility management decisions. Build a workplace strategy that works for your people with accurate, reliable office space optimization software. Gain new insights into your utilization with custom dashboards and reports, and easily share those visualizations with others. Commander BI measures big data consistently, continuously and systematically. Turn raw data into valuable answers for corporate real estate executives, space planners, workplace strategists, facility management and human resource strategists.